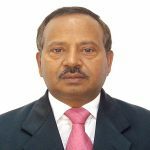 Shri Nagendra Nath Sinha IAS (JH-1987) took charge as Managing Director, National Highways & Infrastructure Development Corporation limited New Delhi on 07 August 2017. Prior to this, Shri Nagendra Nath Sinha , M.Sc ( Health Sciences, Johns Hopkins University), B.Tech ( Electrical, IIT Kanpur) was working as Additional Chief Secretary, Rural Development, Govt. of Jharkhand where he played pivotal role in organizing rural poor, creating sustainable livelihood & employment opportunities & NRM based development.